Lieutenant General Charles C. Blanton was deputy chief of staff, programs and evaluation, Headquarters U.S. Air force, Washington, D.C.
General Blanton was born in Shelby, North Carolina, in 1930, and graduated from Kenwood High School in Baltimore. 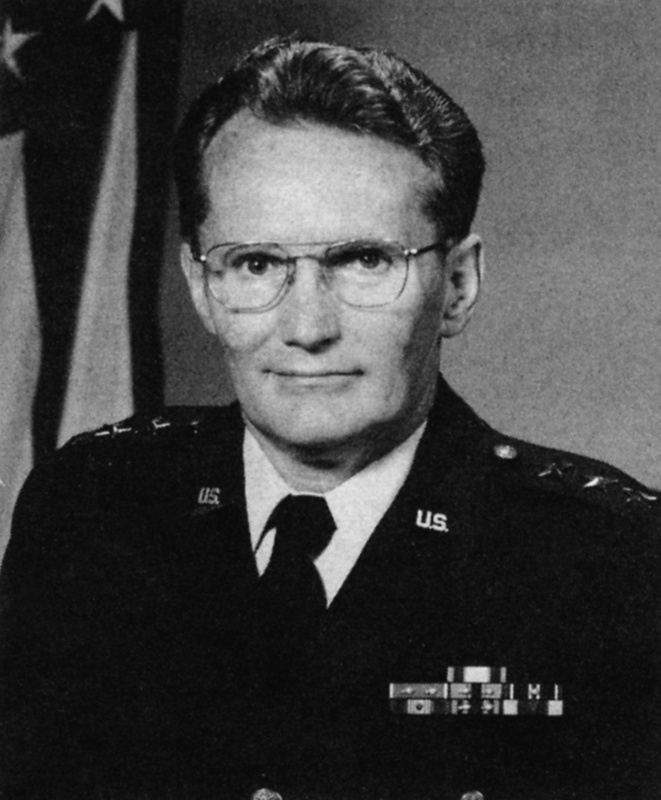 He majored in financial management at the University of Maryland and graduated in 1952 with a bachelor of science degree (Phi Kappa Phi honor society), and as a distinguished military graduate of the Reserve Officers' Training Corps program received a commission as a Second Lieutenant in the U.S. Air Force. He graduated from the Air Force Institute of Technology at Wright-Patterson Air Force Base, Ohio, in 1959 with a master of business science degree. General Blanton completed Squadron Officer School through the Extension Course Institute in 1959, Air Command and Staff College at Maxwell Air Force Base, Ala., in 1964 and the National War College at Fort Lesley J. McNair, Washington, D.C., in 1968. He graduated from the Harvard University Advanced Management Program in 1970. In August 1952 he entered active military service and was assigned as assistant finance officer and later deputy finance officer, 4415th Air Base Group at Pope Air Force Base, North Carolina. From October 1954 to August 1958, General Blanton served with the 81st Bombardment Wing at Royal Air Force Station Bentwaters, England, as assistant finance officer, finance officer, and accounting and finance officer. He returned to the United States and studied graduate applied comptrollership at the Air Force Institute of Technology, where he graduated with honors (Beta Gamma Sigma). General Blanton was assigned to Headquarters Air Defense Command at Ent Air Force Base, Colorado, from October 1959 to August 1963, in the Office of the Comptroller, as budget officer, Systems and Procedures Group, and later as chief of the operating branch in the Directorate of Budget. In September 1963 he went to the Air Command and Staff College. In June 1964 he was named faculty adviser, Wing II, Directorate of Student Operations and later was project officer, Special Programs Division, for three years. From August 1967 to May 1968, General Blanton attended the National War College. After graduation he was named deputy chief of staff, comptroller, Alaskan Air Command, with headquarters at Elmendorf Air Force Base, Alaska. While he was at Elmendorf General Blanton was temporarily assigned to Harvard University to attend the Advanced Management Program. In August 1970 General Blanton transferred to Headquarters U.S. Air Force, Washington, D.C., where he served in the Office of the Comptroller as chief of the Cost Division in the Directorate of Budget; in August 1971 he became deputy chief, Budget Management Division; and in October 1973 was appointed deputy director of budget. In May 1974 he was assigned to Headquarters Air Force Systems Command at Andrews Air Force Base, Maryland, as deputy chief of staff, comptroller. In August 1974 he returned to the Office of the Comptroller of the Air Force as director of budget, and in December 1976 he was assigned as director of legislative liaison, Office of the Secretary of the Air Force. He assumed his present duties in May 1980. His military decorations and awards include the Distinguished Service Medal, Legion of Merit with two oak leaf clusters, Air Force Commendation Medal with two oak leaf clusters and Air Force Outstanding Unit Award ribbon with oak leaf cluster. General Blanton was promoted to Lieutenant General May 9, 1980, with same date of rank.